When I invited one of my favorite Pacific Northwest SUP competitors to answer a few questions about SUP and his life, I expected a short response mostly focused on his very cool training routine. Instead, Cyril responded with a treasure of a story. It’s a fascinating read filled with insights and suggestions easily woven into a family’s experience. Please enjoy every word – all the way to the powerful final lines. Family is my priority, my love, and my passion; however, sports and the outdoors are right up there as well playing a big role in every decision, every dream and aspiration. The great thing is I don’t have to sacrifice one for the other. They can all be combined together – they are all part of a lifestyle, and the more I explore this lifestyle, the further I get pulled into it. I credit the Northwest and watersports communities for helping us see the way along this journey. 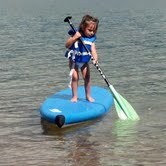 My wife and I standup paddle (SUP) and ski, so our kids do it as well. We don’t watch any cable television, so our kids don’t either. We realize that our children will get more and more influenced by mainstream culture, but we believe they will naturally gravitate to this lifestyle because it is so good. Cyril and his wife, Tiffany, share the family-sports stoke! I always played sports as a child, but nothing close to what my children are getting. I did get to explore the world, its cultures and landscapes and always had a love for travel and the outdoors. It wasn’t until my early teen years that I started my near obsessive relationship with sports, but they were all indoors or on artificial fields. I competed in NCAA Div I track and field and learned a lot about training discipline and the importance of technique and repetition. I even wrote an essay about the benefits of sports for children (my now wife was a classmate of mine). In my 20s, I finally started experiencing outdoor sports. I also became a proud father of two girls, Erica and Isabel. Now a father of two daughters, I have learned so much from them. I’ll be honest, when I first found out we were having a girl, we were living temporarily in Texas, and my then old-world (‘traditional’) way of thinking, had me thinking sports as a family were going to be lower priority, probably something I’d have to go and do alone. I was visualizing Barbie dolls and pink stuff everywhere. 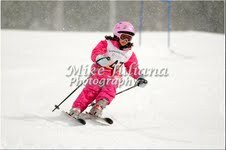 I was only partly right: the pink stuff became Erica’s ski jacket and goggles following behind me on steep ski runs and hucking off a 4ft jump when she was 3 feet tall, the pink KIALOA sticker on her Keiki paddle, and my daughters’ pink gymnastics leotards bouncing up and down almost daily on our backyard trampoline. Fun. Keep it fun. This is not the time to get an adult workout in. Build a snowman, stop to check out the wildlife, enjoy the large tree roots and caves on the mile long trail down to the surf spot. Show your passion and fun – bring out that inner child that is so easy to do with sports. 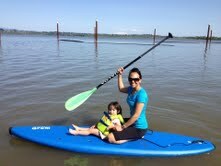 On our many trips to summer SUP races, we try to mix sightseeing to keep it fun for the kids. My fellow KIALOA paddles teammate, Karen, is really good at this as well – our families actually met up at a wildlife safari park on route to the same SUP race last year. Explore, diversify. As I mentioned, we are a ski and paddle family, but we also mix in other activities, such as gymnastics, swimming, slackline, trampoline, bike rides, playpark, beach. 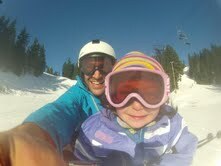 We learned from this after we put Erica in a full weekend, all winter, ski race program at 5 years old: she loved it and excelled at it, but she burned out and wanted to do other things. We’ve since dialed back and now try to diversify the activities more. For example, we will not do more than two days of the activity our children are requesting. Living in the Northwest makes diversity easy – I’m writing in the Spring, when we can literally do every sport mentioned above and there is a whole community behind each sport wanting us to be a part of it. Balance, agility, suppleness. I’ve read several studies that examine what is most important in a child’s development at different ages. For youth under 8 years old, these three skills seem to be the most important for development. Endurance and strength come in the later years. 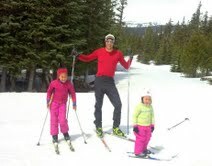 For this reason, our cross country ski loops and paddles are short. Most events we have been to organize short kids races, which is great. We spend more time jumping, turning and showing off. Gymnastics, the playpark, our basement trapeze and the trampoline have all been great for our girls – they gravitate to these sports on a daily basis to use up every bit of energy they have. Rainy days rock! As parents, we model that rainy days don’t stop the lifestyle. We’ll still walk to the supermarket, I still paddle and bike to work regardless, we never say “oh no, it’s raining!”. Actually, SUP in the rain is amazing when the water is calm – I love the way the rain drops hit the water, and I still paddle just as fast! Rain in the winter also means it is snowing in the mountains, which is great for our ski season. Our family is always watching weather and planning our next adventure and for that reason we get more sun than anybody else. I have many stories of friends complaining about a rainy weekend, when it was actually sunny an hour away at the coast or mountain. TV is for family movies. Provide kid’s gear. It doesn’t have to be high end; it doesn’t need to be waxed. 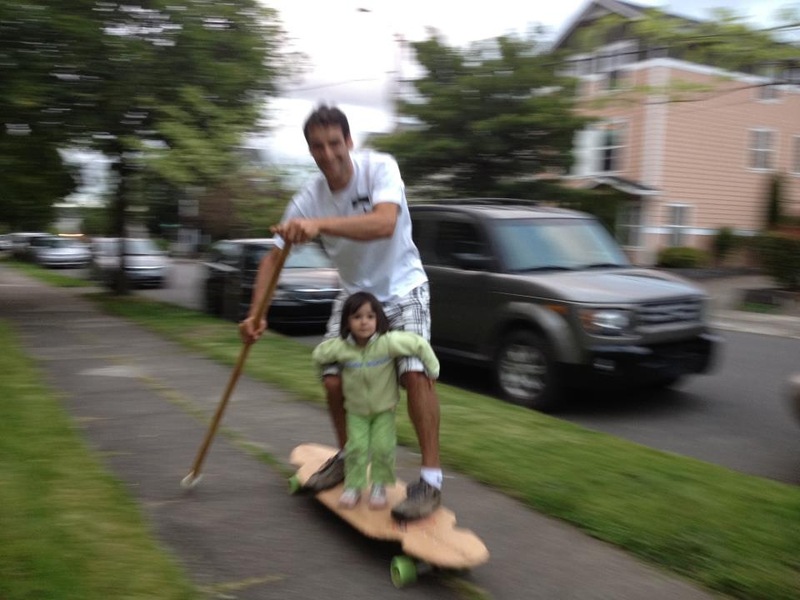 Our kids love knowing they have their own gear – whether it is a paddle to take dad’s board around, or some hand-me-down skis from big sister or friend. This can be the most challenging for finances, especially when trying to diversify and explore many activities. 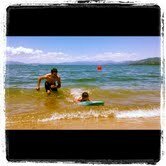 We found an incredible combo in our kids’ board, the Tahoe SUP Grom and paddle, the KIALOA Keiki adjustable paddle. Both pieces of gear should last them from age 2 to 12! Listen – and HEAR. It gets old hearing “great job!” and “you were awesome!”. Those are obviously very important, but having been on the receiving end as a young athlete, I know the importance of getting honest feedback and encouragement. I forever thankful to my mother for having always stopped to listen to me talk about my sport and what went right or wrong. We ry to let our kids communicate and think through what they have done, and I believe it does them a lot of good to discuss specific examples of what was a ‘great job’ and what was not so awesome. Healthy eating. Last, but definitely not least. This obviously starts with the parents and is truly a lifestyle. We don’t claim to be experts, but we enjoy learning and talking about food. We try to talk to our kids about the benefits of different foods and how to combine foods. Erica’s top 5 foods: 1. Red lentils, 2. Spaghetti, 3. Tomato soup, 4. Pizza, 5. Raw peppers. There are many more things, such as sleep, that could make the list. The main one – have FUN! Get out there regardless of the weather – you might surprise yourself and your kids won’t even know the difference. To them, nothing beats being outside with mom and dad! This entry was posted in People and tagged Cyril Burguiere, elder sup, KIALOA paddles, Pacific Northwest, PNW SUP by Water Words. Bookmark the permalink.